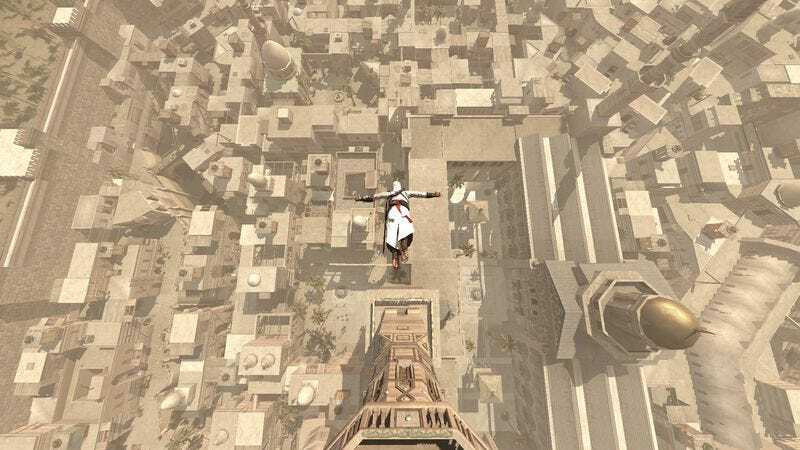 Some people think that the assassins are the heroes of the Assassin’s Creed video game series. After all, the assassins defend the cause of justice, primarily by stabbing people who deserve it (and sometimes people who don’t deserve it, but this is the price we pay for living in a stab-based economy). True Creed fans, however, know that the real heroes are the haystacks that save your life over and over. Every time you leap from the top of a cathedral—which is a thing you do, obviously—there’s a haystack strategically placed to cushion your fall and send you on your merry stabbing way. They’re the grain-based equivalent of Knight Boat’s fjords: quiet, dutiful landscape features that make the story possible. Since the approximate height of the games’ haystacks is about 1.5 meters, the University Of Leicester has essentially accused the Creed hay of cheating. Perhaps the hay is corked, the researchers would have you believe, or laced with pine tar, or underinflated to improve its grip on the hero. The students’ paper further concludes that a 1.5-meter haystack would only break a fall from about 12 or 13 meters, which is just the sort of fear-mongering you’d expect from a study that was probably funded by Big Haystack. Sure, University Of Leicester, the solution to the problem is to buy enormous corporate haystacks. How convenient. We at The A.V. Club are having none of it. Ignore this so-called science and support your independent local Assassin’s Creed haystack, because 1.5 meters of haystack ought to be enough for anybody.